Pawpaw | Gurney's Seed & Nursery Co. 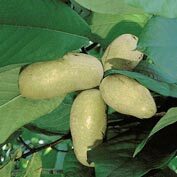 Growing 15-30 ft. tall, pawpaws make attractive specimen trees with a pyramidal shape and big, tropical-looking leaves that put on a spectacular golden show in the fall. The 3- to 5-in. fruits will darken in the late summer—that's when the luscious flavor is at its peak! Zones 5-9. Height: 15 - 30 feet. Spacing: 15 - 20 feet. Depth: Plant at the same depth it is in the pot. 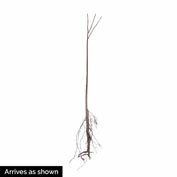 Bareroot - plant so roots are below soil level. Foliage: Deep green, drooping, oval leaves, 4 x 12 inches. Fruit: Greenish-yellow, almost black when ripe. Zone: 5 - 9 (-10° F.). Form: Small deciduous tree, rounded. Soil Requirements: Rich, moist, well-drained, organic, slightly acidic soil. pH of 5.5 - 7.0. Growth Rate: Medium to fast growth rate. Approximately 2 feet per year. Pruning: You can prune them back to about a 3 feet high and they will then throw several new branches from below the cut. Each branch will bear fruit and, provided that you fertilize the tree well, the fruit will be of a good size. You can repeat the pruning on each of the branches once they again become too tall to harvest easily. 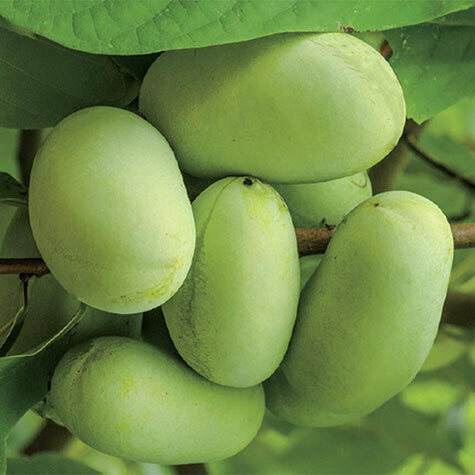 Comments: Growing 15-30 feet tall, pawpaws make attractive specimen trees with a pyramidal shape and big, tropical-looking leaves that put on a spectacular golden show in the fall. The 3-5 inch fruits will darken in late summer-thats when the luscious flavor is at its peak! 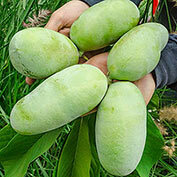 Uncommon despite its native status, ripe pawpaws have a short shelf life, making them difficult to sell.